For an easy, light dessert to cap off your New Year’s Eve dinner, we nominate berries marinated in Champagne or other sparkling wine. Some sparkling wines are vinified to be sweet (see below). But if you can’t find one, or have dry sparkling wine on hand, you can mix it with a bit of agave (a great low-glycemic sweetener) or honey to sweeten the marinade. You can also use simple syrup if you have it on hand. It’s more difficult to dissolve sugar; but if that’s all you have, pulse it to a superfine consistency in a food processor. If you sweeten the marinade, note that agave is twice as sweet as honey and sugar, so you need less of it. Agave is like honey in sweetness and viscosity, but without the unique honey flavor. Final tip: Champagne is expensive, so for the marinade you can substitute a more affordable sweet wine like Moscato. It can be found for just $8 or $9 a bottle. 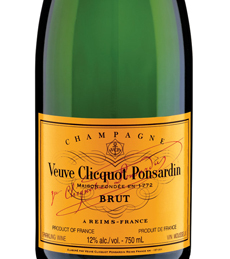 Splurge on a sweet-style Champagne to serve with the berries; or continue on with the Moscato. Marinate berries for 30 minutes before serving. Photo courtesy TruWhip. 1. COMBINE the Champagne and agave in a large bowl. Add the berries; toss gently to combine. Cover and chill for 30 minutes or longer. 2. PLACE 3/4 cup berry mixture in each of 8 bowls. 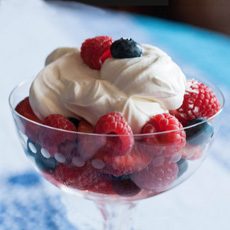 Top each serving with 1/4 cup whipped cream or a dab of mascarpone. Divide the crushed amaretti cookies among servings. to match the sweetness of the dessert. 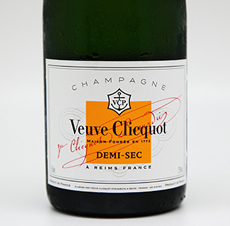 Champagne is made in seven styles, or levels, of sweetness. The sweetness comes from a step in the secondary fermentation of Champagne, when the bubbles are created. The process is called dosage (doe-SAZH): a small amount of sugar is added into the wine bottles before they are corked. The sugar also reduces the tartness/acidity of the wine. Primary fermentation of Champagne: In the classic méthode champenoise used to make Champagne, Cava and American sparkling wines, the primary, or alcoholic, fermentation of the wine transforms the grape must (the pressed juice of the grapes) into wine. Natural yeast consumes the natural grape sugars, producing alcohol and carbon dioxide. Secondary fermentation of Champagne: To create a secondary fermentation, the dosage is added to the wine. The the added yeasts eat the added sugar, again creating alcohol and carbon dioxide. †It’s a paradox in the Champagne industry that “dry” indicates a sweeter wine; as do sec (which means dry in French) and demi-sec. Doux, the sweetest style of Champagne, does mean sweet.